The latest data on each ICE arrest for the first time now allows the public to track in some detail over 2 million ICE arrests from October 2008 through June 2018. These are what ICE refers to as arrests that occur in the interior of the country, and exclude arrests by Customs and Border Protection (CBP). This report focuses on the source of each of these ICE arrests and how the volume of this activity—along with the way ICE takes individuals into custody—has changed over the past decade. Simultaneously released with this report is the first edition of TRAC's "ICE Arrests" app. The data available covering October 2014 - October 2017 includes the state and county where each ICE arrest occurred. This was not obtained from ICE as the agency contends it doesn't track the state or county where the apprehension occurred. Painstaking research by TRAC using a mosaic of records obtained from a range of sources, including those derived from hundreds of separate FOIA requests over the span of several years, has allowed TRAC to independently identify the state and county where most arrests occurred. Sometimes the county listed includes closely surrounding areas where it was not possible to further isolate the arrest location. This free online query tool allows users to examine ICE arrest activity along 15 separate dimensions. In addition to when and where each arrest occurred, information has been compiled providing details on how the arrest occurred. These details are combined with the characteristics of the individuals who were targeted, as well as the immigration violation they were charged with. For cases that ICE has closed, the final outcome recorded by ICE for each individual is also tracked. Historically, the vast majority of ICE arrests occur when the agency assumes custody of immigrants from another law enforcement agency. Since Trump assumed office, roughly three out of four ICE arrests were what ICE refers to as "custodial" arrests. See Figure 1. That is, the individuals were already being held by another law enforcement agency and ICE assumes custody of them. (Not counted in these figures are individuals turned over to ICE from CBP for detention and eventual removal.) A large number of these (22%) were serving prison time in federal and state prisons and were released to ICE at the end of their sentence. An even larger number (41%) had been arrested by local police or sheriff's offices. Most of these were booked into jail and then turned over to ICE. A small additional component (6%) involved law enforcement agencies that had signed cooperative agreements under a Memorandum of Agreement through ICE's 287(g) program. Additional arrests (6%) came from a miscellaneous combination of other sources. The remaining one-quarter (25%) were individuals arrested at their home, place of work, or elsewhere in the wider community including at courthouses or at DHS offices when the immigrant had appeared for an appointment. Table 1 at the end of this report provides month-by-month figures on the recorded source for each ICE arrest from October 2008 through June 2018. As TRAC reported last June, ICE interior arrests overall are up as compared to the last two years of the Obama Administration after implementation of the Priority Enforcement Program (PEP) that focused arrests on the most serious criminals and recent illegal border crossers. However, current ICE arrests remain only half the levels of five years ago when Secure Communities held sway under President Obama. Since President Trump assumed office at the end of January 2017, ICE arrests in the space of two months jumped 47 percent. Apprehensions during March 2017 climbed to 14,063. However, since then arrest numbers appear to have stabilized. While there is natural month-to-month fluctuation, if anything ICE arrests have trended slightly lower. During September 2017 arrests numbered 13,083, and during June 2018 they were 13,221. See Figure 2. While the level of ICE custodial arrests are little changed from the levels in October 2014 at the end of the Secure Communities era under President Obama, at-large or "community" arrests have increased. The dark blue shading in the monthly time series chart in Figure 2 distinguishes community arrests from custodial arrests. Community arrests are displayed by themselves in Figure 3. In March 2017 community arrests climbed to 4,275, but have fallen back slightly since then. For example, there were 3,345 community arrests during September 2017 and 3,216 during June 2018. Despite stepped up enforcement efforts, ICE also appears to be taking into custody fewer individuals directly from state and federal prisons than was true under President Obama. These arrests involve the agency's Criminal Alien Program and focus on noncitizens serving sentences in federal and state prisons. Both the absolute numbers of arrests, as well as a proportion of total ICE arrests from federal/state sources, have generally fallen based on available ICE records. See Figure 4. These immigrants typically have been convicted of more serious crimes. Historically, proceedings are held during their time in prison and those found to be deportable then have been released to ICE custody at the end of their prison term. The largest single component of ICE arrests remain those where noncitizens are picked up from local jails run by police and county sheriff departments. 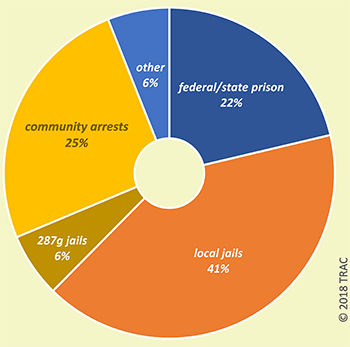 As shown in Figure 5, current ICE arrests from local jails are dwarfed by the level of ICE activity during the first half of Obama's Administration. Then ICE assumed custody of between 12,000 and 14,000 noncitizens from local jails (excluding 287(g) arrests). Under Trump, the highest monthly total in August 2017 only reached 6,585. While this number was up sharply from the level of activity during last two years of the Obama Administration under the agency's Priority Enforcement Program, ICE arrest numbers now appear to have stabilized and indeed during FY 2018 are down slightly from their peak during FY 2017. In June 2018, for example, there were only 5,363 ICE arrests from this source. Custodial arrests from local law enforcement agencies through ICE's 287(g) programs have undergone the most marked change over the last decade. Under this program, while the immigrant was usually booked into a local jail, they often had not been convicted of any crime. A study by the Migration Policy Institute (MPI) in 2011 found the program despite its announced aims did not target serious offenders. In fact, MPI found that "about half of 287(g) activity involves noncitizens arrested for misdemeanors and traffic offenses." ICE arrests under this program grew rapidly between October 2008 and the summer of 2010, reaching a monthly peak of 3,588 arrests in June 2010. Beginning in the fall of 2010, as shown in Figure 6, ICE 287(g) arrests dropped off rapidly. Since President Trump assumed office, there has been a slight rebound. In October 2017 ICE recorded 824 arrests through the 287(g) program, in January 2018 there were 945, and in June 2018 there were 842. Currently ICE reports it has 287(g) agreements with 78 law enforcement agencies in 20 states. ICE lists these law enforcement agencies and includes links to their respective signed Memorandum of Agreement (MOA).